I joined Matt and Lionel at Home Wood on Monday night in Bedfordshire. 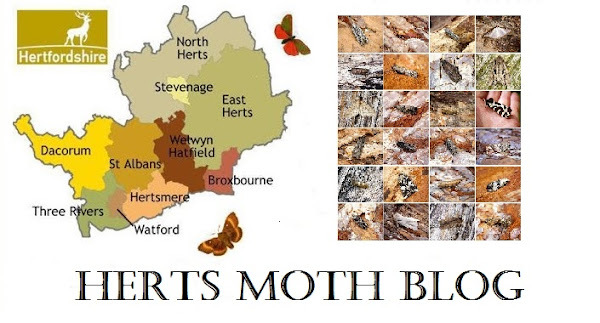 The day had been absolutely scorching and hit nearly 30 degrees during the day and the night was meant to go no lower than 19/20 degrees, perfect muggy weather for moths despite clear skies we had absolutely no wind at all and no moon to contend with. We setup 5 traps and a light and sheet under sweaty conditions, it was hot stuff indeed and once again I attracted Horse-flies! As soon as it got dark, moths were absolutely everywhere with micros at first in their hundreds and then the Geometers started coming in and finally the Noctuids and boy was there action around the lights. I've been out before and had trouble with lots of midges and flies but never have I had as much trouble from inhaling moths as well. The species kept tallying up and it was hard to keep up. We got to 100 species about 2 hours in and then from midnight it was about 1 or 2 a minute being jotted down. Highlights were massively over-whelming with two County first species to start with....Rosy Marbled and Elegia similella. Copied from Andy Banthorpe's email. Gen Dets of species retained so far. Other Macro highlights were Cream-bordered Green Pea, 10+ Scarlet Tiger's, 5x Marbled Brown and Mere Wainscot. In total for the time being we recorded 140 species of Macro and 148 species of micro, eclipsing my highest ever previous species of 252 with a grand total of 288 species!! We finally finished packing up (which took over 2 hours) at 4am as it was getting light. Thanks guys for the help you gave me and adding to the list as we went through the night.